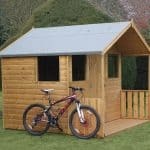 As the name suggests, this shed has been built with durability in mind. From the outside it certainly has an impressive rigid design thanks to the Shiplap clad walls. However, the interior solid sheet materials do let it down considering the price bracket. It comes with three windows, with two being fixed and one that is openable. 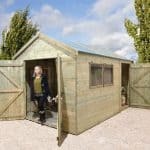 The shed also benefits from double doors which not only open up wide for excellent access, but they are also designed to last, offering a well-braced, thick design. The walls of the shed have been dip treated to promote water-resistance and protect it against rot. It even comes with a 10 year anti-rot guarantee. Whilst we do feel the interior could be upgraded, one thing we do like is the planed kiln dried framing. This style framing is pretty unique and it prevents splitting as well as offering more stability. An apex roof gives you plenty of height inside the building, whilst a pad bolt attached to the doors helps to keep them closed when not in use. 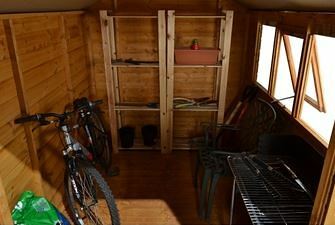 There are a few things that could really be improved, but all in all this medium size shed does offer plenty of space to store a wide variety of items. Poor quality roofing felt. This can easily be upgraded however, but you will need to buy it elsewhere. 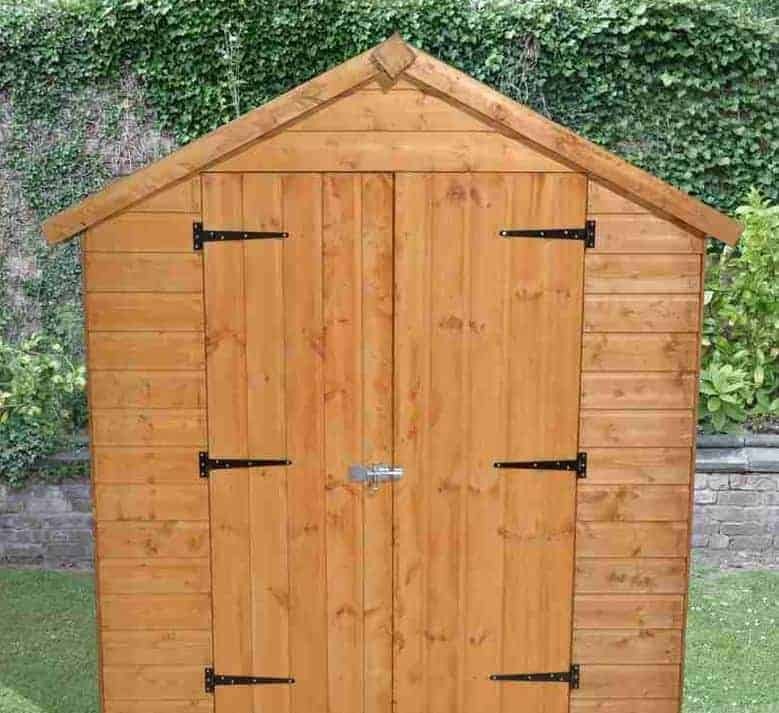 This is one of the most common sized storage sheds on the market and it provides a secure place to keep your gardening equipment and tools. 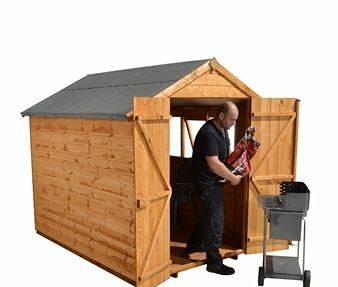 Part of the Shed-Plus collection, this heavy duty shed is built to last. The ridge height is incredibly tall, offering generous head space in the interior of the shed. The height of the doors is also good, ensuring most people won’t need to duck down as they enter the shed. The width on the other hand is a little shorter than most. However, as there are double doors this isn’t really a major concern as you are still left with a good amount of space to get in and out of the shed with bulky equipment. The shed benefits from the very traditionally designed apex roof. With this design you tend to get two great benefits. Firstly it is one of the best roofs used to combat rot as it doesn’t give rain the chance to settle and soak into the roof. Secondly it adds more height into the building, making it easier to manoeuvre around inside. Unlike the rest of the shed, the roof is made from OSB materials. However, if you find this feels a little too flimsy you can easily install a few roof joists. The floor on the other hand is made from tongue and groove. So whatever you need to keep in the shed, you can be sure the floor is capable of holding its weight. Tongue and groove floors also have the added benefit of feeling a lot stronger underfoot. This shed makes use of the highest quality cladding to ensure it can withstand all that the British weather can throw at it. Shiplap tongue and groove forms a solid construction that is resistant to drafts and water. It interlocks, which in turn makes the shed a lot more rigid as well as weatherproof. If you’re not a fan of the rough-sawn look then this is a great alternative. Shiplap cladding creates a flawless, stylish finish which looks great in any garden. Its water resistance is second to none. This is largely down to the grooves incorporated into the claddings design. They are located between every panel and they will literally channel any rainwater straight off the building. The framing of this shed is a little different from most. 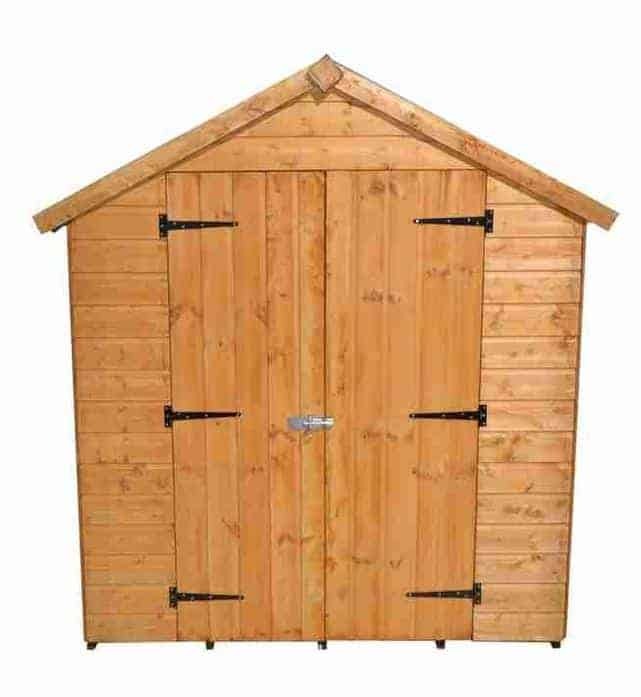 However, Shed Store do cause some confusion by listing the frame as 28mm x 28mm in the specifications and 35mm x 28mm in the description of the shed. Whatever its thickness, the frame is planed kiln-dried which basically means it is less likely to split and offers more stability than a standard frame. One advantage of this shed is that its walls have been dip treated by the manufacturer. Annual treatments are needed but the initial treatment after construction can be delayed for up to 6 weeks thanks to the dip treatment. The heavy duty design has been carried through to both the doors and the windows. Like you can see on the picture, the doors benefit from thick bracing to stop them sagging. They also open up to reveal a very large amount of access space, enabling you to get virtually any tool or equipment into the shed without any problems. They also have a pad bolt to secure them in bad weather. The way the windows have been designed is also unique to this model. Two of them are fixed, whilst the other can be opened. They are styrene glazed which means if they are broken they won’t shatter; therefore reducing the risk of injury. As it benefits from interchangeable sides, you can also move the windows to any side of the shed. 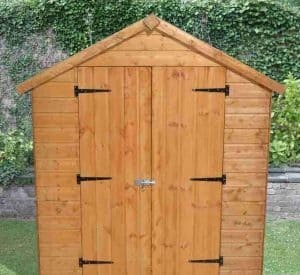 This is neither the most private nor the most secure shed we have reviewed. Its pad bolt requires a padlock which isn’t supplied and the three windows will allow people to peer in and see all of the buildings contents. Improving the security isn’t an issue, although due to the cost of the shed we would have expected it to come with a padlock included. The privacy can also be enhanced if you put up curtains or netting for example. 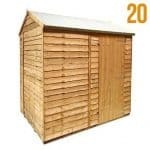 We’ve discovered that Shed Store offer a lot of the same extras for the majority of their sheds. This one gives you four different options and all of them could be considered a good investment. The two DIY treatments in Harvest Gold and Dark Brown, offer excellent element protection. As stated, annual treatments are necessary so these could be seen as an essential investment. The different colour choices also help you to alter the appearance of the shed, giving it a more professional finish. The only thing to be aware of with these particular treatments is that they are mainly designed to be used on rough sawn timber. As this shed is constructed from Shiplap tongue and groove, it could be a good idea to buy a better quality treatment elsewhere. One extra we do recommend is the alarm padlock. If security is high on your list of priorities, this padlock is must-have. It sounds a loud, high pitched alarm if somebody tries to tamper with it. This alarm then only stops if no more movements or vibrations are detected. There’s also a Yale security kit on offer, but as the only thing that it includes that the alarm padlock doesn’t is a hasp and staple, this isn’t really an essential purchase. If you aren’t already aware, it is vital that any outdoor building is built on top of a solid base. Where concrete isn’t available, the wooden DIY shed base kit could come in really useful. It is supplied with a 15 year warranty and comes with useful spikes to secure the base into the ground. This is one of the better quality shed bases available and it can be used straight away which is another advantage over some of its competitors. Your last option is a solar light. As this is large enough to walk around in, a solar light could be very useful at night or on darker winter days. It is incredibly affordable and it features six LED bulbs which are powered by a small remote solar panel. It’s quick and simple to install and basically provides a free light source with no running costs to worry about. This shed almost receives top marks for quality. If it wasn’t for the poor quality felt and solid sheet roof we would have rated it higher. The cladding is superior and the design is modern and stylish. 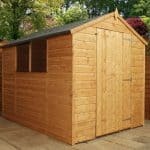 If you’re looking for an excellent quality, affordable shed then this is just what you are looking for. 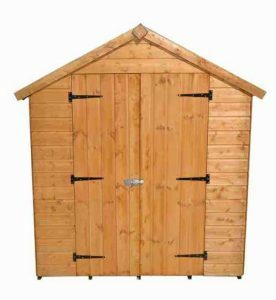 As the majority of the shed is built with a tongue and groove design, it is extremely durable and naturally resistant against the elements. It comes backed by a 10 year anti-rot guarantee, though annual maintenance is required to benefit from this. 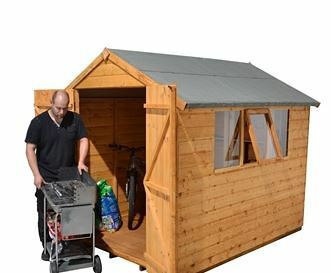 Medium size sheds such as this one offer plenty of storage space to keep various equipment and gardening tools. As the floor is strong and the cladding enables shelving to be installed, the storage potential is fantastic. 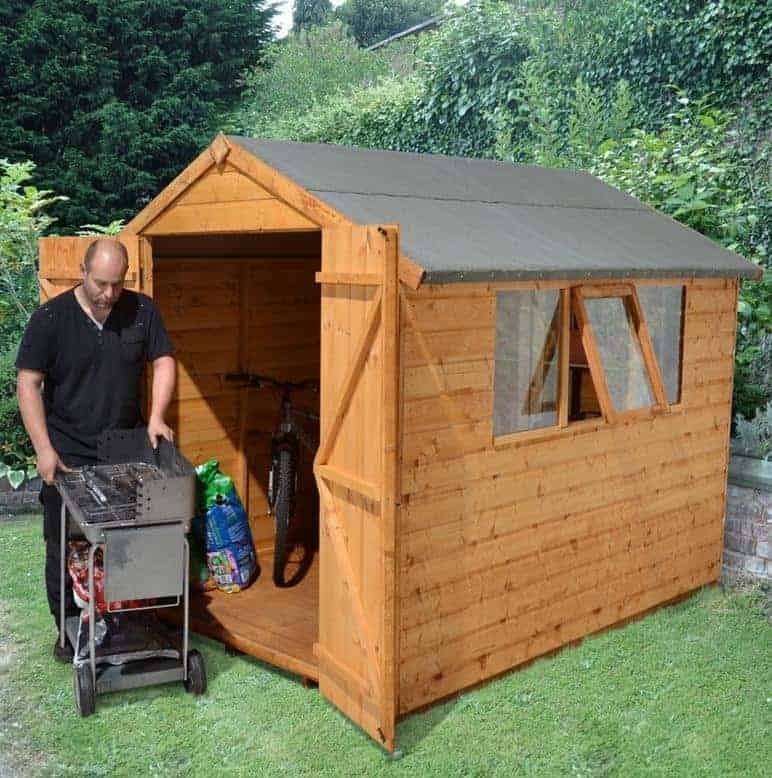 Guidelines suggest that the shed will take from 2-4 hours to assemble. However, this will depend upon a number of factors such as how many people are putting it together. No customers have reported any issues and full instructions and fixtures are provided. 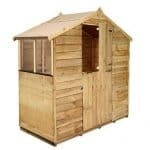 The solid construction and high quality design make this shed very good value for money. You just need to factor in the annual treatments and security upgrade. 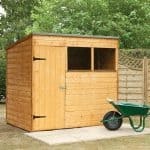 Final Thoughts: This great medium size shed is ideal for various types of storage. Though the floor will need to be upgraded if you want to store heavyweight equipment, overall it does have a very solid build. The fact it comes with both opening and fixed windows is unique and allows you to benefit from both natural light and ventilation. The double doors ensure you have more than enough room to transport your tools and equipment, whilst the pad bolt allows you to attach a padlock to keep them adequately secured. Thanks to the strong tongue and groove Shiplap cladding, the shed benefits from a strong, interlocking weatherproof design.